Do you tend to gain weight easily, especially in your lower body? If your diet is in check and you're sticking to your workouts, your genetics might be the culprit. The endomorph body type is prone to weight gain. Its slow metabolism and big appetite make it difficult to stay lean, but it also allows for faster muscle and strength gains. The right diet can turn your weaknesses into strengths and help you build the body you're after. Back in the 1940s, psychologist William Sheldon classified body types into three categories: endomorph, ectomorph and mesomorph. Ectomorphs are thin and find it difficult to put on weight as either muscle mass or body fat. We all have that one friend who can eat everything in sight without gaining a pound — that's an ectomorph. Mesomorphs are naturally fit and muscular, with a narrow waist, wide shoulders and solid torso. They find it easy to build muscle and lose fat. Endomorphs are characterized by roundness. They have a large, round belly, a round head and short limbs. They tend to store fat, and they find it hard to maintain a healthy weight despite training hard and eating clean. Their wrists and calves are slim, which poses further challenges when it comes to building muscle and strength. In general, they carry their weight in the thighs, buttocks and lower abdomen. According to the American Council on Exercise, the endomorph body type has a lower tolerance for high-carb foods. This means that any carbs you eat are more likely to be stored as fat. Furthermore, endomorphs have quite a big appetite and may find it difficult to eat clean. If you fall into this category and want to get leaner, keep your carbs in check and watch your portions. The endomorph nutrition strategy emphasizes high-protein foods and healthy fats over carb-rich foods. For best results, cycle your carbs and cut back on simple sugars. Feel free to have cheat meals once in a while, but keep them to a minimum. A low-carb diet can make it easier to lose stubborn fat and keep the pounds off. A 2018 study published in The BMJ found that cutting back on carbs may increase metabolism during weight-loss maintenance, especially among people with high insulin secretion. The low-carb group had lower ghrelin levels and burned more calories throughout the day compared to the high-carb group. Leptin levels were lower too in low-carb dieters; this hormone is produced in the body's fat cells and regulates energy balance. Just because you're an endomorph, it doesn't mean you have to be chubby. Individuals with this body type gain muscle and strength quite easily. All it takes is the right diet and workout plan. An endomorph diet will be high in protein, low in carbs and moderate in fat. High-protein foods should come first on your list. Think lean meat, fish, poultry, eggs and low-fat dairy. Depending on what your macros look like, consider adding protein shakes to the mix. 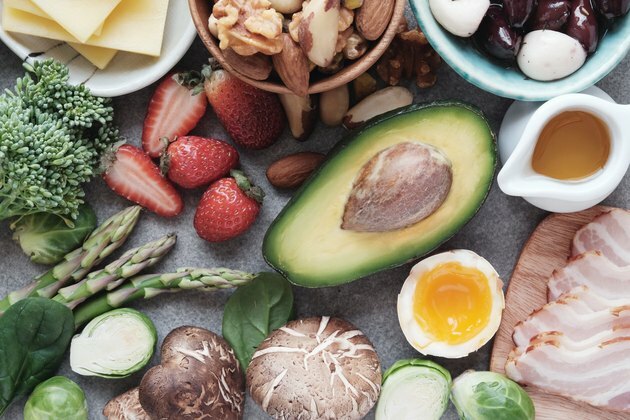 According to a 2016 study featured in The Journal of Nutrition, protein-rich foods are more effective at suppressing appetite than fat and carbs. This nutrient not only promotes fat loss and muscle growth but also curbs hunger. Another study, published in Obesity Facts in 2017, found that subjects on a high-protein diet lost significantly more weight compared to the standard protein group. Researchers point out that an increased intake of protein helps preserve lean mass when combined with exercise. Now that you know what an endomorph meal plan should look like, let's see what you can eat to maximize fat loss and stay lean. Endomorph nutrition is centered on protein. The higher your calorie intake, the more protein you need in your diet. Choose lean meat over fatty cuts, eat fish at least twice a week and snack on high-protein foods between meals. With this approach, you'll stay full longer, make faster gains and lose excess fat. Contrary to popular belief, high-protein diets are not harmful. In 2016, the Journal of the International Society of Sports Nutrition published a study assessing the effects of a hypercaloric, high-protein diet on overall health and body composition. Subjects who engaged in strength training and consumed 2.6 to 3.3 grams of protein per kilogram of body weight daily for four months didn't experience any changes in hepatic or kidney function. Their body composition and blood lipids were unchanged at the end of the study. These findings indicate that a high-protein diet may help prevent weight gain, even if you're in a caloric surplus. Another study, which appeared in the Journal of the International Society of Sports Nutrition in 2015, found that high-protein diets may positively alter body composition in healthy resistance-trained individuals. Subjects did not perform any cardio exercises — yet their body fat levels decreased. Researchers attribute these benefits to the metabolic changes resulting from a high-protein diet. Most gym-goers have heard about the Atkins diet, the keto diet and other popular weight-loss plans. What these have in common is their high fat content. The ketogenic diet, for example, encourages fat consumption and limits carbs to 30 to 50 grams a day. Some versions go as low as 10 grams of carbs per day. This slimming plan has been shown to reduce total fat mass and abdominal fat without affecting lean mass, especially when combined with resistance training. However, you can get leaner without going on a ketogenic diet. Just make sure you eat plenty of protein and healthy fats while cutting back on carbs. A typical endomorph diet might include nuts and seeds, fatty fish, olive oil, coconut oil, avocado, almond butter and even dark chocolate. Ideally, focus on adding more omega-3s and other good fats to your meals. Cooked salmon, for instance, provides 234 calories, 25 grams of protein and 14 grams of fat per serving. With 183 calories, 4.3 grams of protein and 18.3 grams of fat per 1-cup serving, walnuts make a healthy snack when hunger strikes. The endomorph body type is sensitive to carbs and tends to store them as fat. However, this doesn't mean you should give up carbs altogether. Cauliflower, cabbage, spinach, cucumbers, artichokes and berries are rich in fiber and complex carbohydrates. Plus, they're low in calories and high in water, filling you up quickly. Eat these foods around your workout to get the energy needed for intense training. Your body will use the extra carbs to replenish its glycogen stores and repair damaged tissues. Consume high-carb foods along with protein to stay full longer and ignite your metabolism. If you really want to have a cheat meal, save about 20 percent of your daily calories for cookies, chips or whatever you're craving. Use good judgment, though — one bad meal can ruin days of clean eating. Hit the gym before or after feasting to minimize the damage and burn those extra calories.